There are not so many good quality apps-readers for operation system IOS for iPhone and iPad, as for Android, also among them there are a lot of paid apps. Just recently among the programmes for reading was leading Stanza, but it was deleted from an app store for Apple because of distribution of pirated content. This article can help to choose a good quality programme for reading and not to overpay for it. an opportunity to work with network libraries - OPDS-catalogues, because it's very convenient to download books from them. All programmes rewiewed in this article can work on iPhone, iPad and iPad touch. 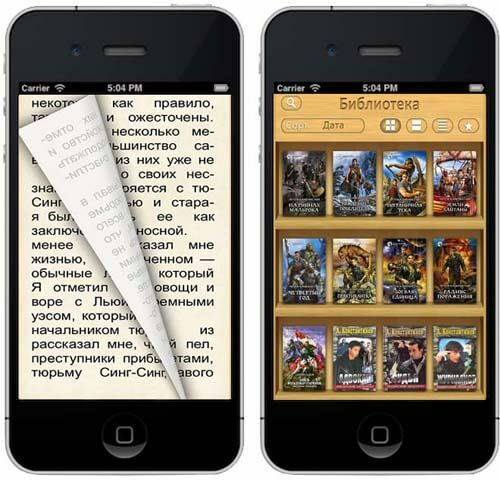 One of the most easy, compact and quickly working apps-readers for IOS is KyBook. Despite the fact of it's ease, there are realized almost all nesessary functions in it: supporting of formats EPUB, FB2, RTF, PDF, DJVU, CHM, CBR, CBZ, MP3, M4A, M4B, work with OPDS-catalogues and network folders Google Books, Google Drive, Dropbox, OneDrive. KyBook can work with dictionaries, read aloud, has a lot of settings of fonts, pictures, brims and so on. The main disadvantage of this programme is inability of flexible adjustment of tap-zones and gestures for scrolling and program management. It is powerful and quickly working programme, although it appeared recently. It supports FB2, EPUB, MOBI, TXT, PDF and DJVU formats and also ZIP and RAR archives, can work with OPDS-catalogues, read aloud. When you add some books into the library of the programme, they're automatically sorted by surnames of authors. Supporting of iCloud. When you add books into a library on one device, it will automatically appear on all your devices, where iBouquiniste is downloaded. The position of reading is also synchronized in iCloud. A unique function "Tracking of eyes". It's possible to turn the page without help of your hands (this function is realized with the help of frontal camera, which reacts on closing one of the eyes of a user). The programme has two levels of settings - easy and advanced, with which help you can set almost the whole interface for yourself. Despite the fact of very rich functional opportunities app-reader iBouquiniste has some disadvantages. This programme is paid, there's no flexible setting of tap-zones and gestures for scrolling and opportunity of work with off-line dictionaries. The free version of the programme iBouquiniste Lite doesn't have an opportunity to work with PDF and DJVU formats, it doesn't work with iCloud and shows adverts in the very last line. Now App Store offers to download MARVIN programme in two versions - free and paid. Both of the versions have the same functions. So, the free version is the same as the paid. MARVIN works only with EPUB format, but, although, many readers call it "the best programme for reading for last years". In this programme almost everything can be set for yourself - fonts, indents, colours, tap zones, gestures for scrolling and programme management. The page on the screen is very similar to paper original, there is supported appearing of footnotes at the bottom of the page. MARVIN copes with downloading books excellentely. There is realized support of OPDA-catalogues, you're able to work with "usual storage" Dropbox, Dropbox, also there is a special interface with programme-librarian Calibrie. There are two big disadvantages in this programme, and they're felt at once. There's only one supported format and only English-speaking interface. The resource appstudio.org contains one more rewiew of programmes for reading on iPad, iPhone.